With rain pelting against the window, there seems little else to do but bake a cake. Especially when there’s nothing else sweet in the house to eat. And if you’re looking for sweet, then the marmalade cake really hits the spot with its drizzle frosting. According to www.rampantscotland.com it was first made in 1797 in Dundee after a Spanish ship sort refuge from a storm and then had to sell its cargo cheap to the locals. Always up for a bargain, never have we wanted to be a resident of Dundee 200 years ago more than now. Cream the butter and sugar. Beat in the eggs one at a time. Stir in the marmalade and zest and then the flour. Bake in a lined round 6 inch tin at gas mark 4 for about an hour or until a skewer comes out clean. Cool on a wire rack. 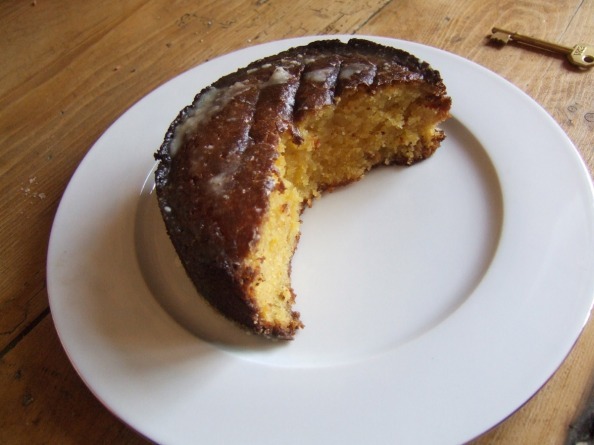 Beat the icing sugar and orange juice together and drizzle on top of the cake while still warm. Yes, it will make a mess. Someone pass Mr Murray a slice of this – there’s always next year, Andy.